As well as the asymmetric organization of cellular components, polarity can also be defined through the structural orientation of the cytoskeleton, in particular, actin filaments and microtubules. This is important in cell migration and motility, which requires a front-rear polarity in order to determine the direction of movement. Both actin and microtubules are polar, dynamic filaments formed of protein subunits. These subunits associate together and align in the same direction to form a polymer which has two distinct ends. These actin filament polymers and microtubule polymers are therefore intrinsically polar, and cytoskeleton-associated proteins can use this asymmetry for further biological functions. Motor proteins such as myosins, kinesins, and dynein catalyze unidirectional movement along actin or microtubules to transport cargo throughout the cell, and this process can also generate polarity through organization of cellular components . For instance, dynein has been associated with the transport of both Par3 and the Crumbs polarity protein to the apical region of the cell . One of the first signals that initiates polarized actin cytoskeletal remodeling arises from the binding of extracellular matrix components to the integrin receptors on the basal plasma membrane. Integrin signaling activates Rac1 , which is involved in the organization of laminin within the basement membrane . In addition, activated Rac1 binds to the adaptor protein IRSp53 and causes the local activation of actin polymerization factors, which are then responsible for assembling a basal actin cortex . At the apical surface, signaling via adherens junctions recruits c-Src, which results in a similar activation of actin polymerization modules through Rac and Cdc42 GTPases . Several studies have also demonstrated the involvement of integrin-based adhesions and adherens junctions in the recruitment and polarized orientation of microtubules. In this regard, integrin-linked kinase (ILK) activated by integrin-beta1 signaling activates microtubule plus ends via adaptor proteins such as APC . 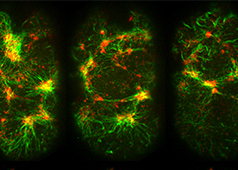 The minus ends of microtubules in fully polarized epithelia cluster at the adherens junctions, where they are stabilized by proteins like ninein . Another recently-characterized protein CAMSAP3 (also known as Nezha) was found to tether the microtubule minus ends to the apical cortex . When a cell is unable to polarize correctly, the resulting loss or mutation of function can lead to disease. Some cell polarity defects include cystic fibrosis, cardiac arrhythmia and oncogenesis . One protein which has been implicated in tumour invasion is AmotL2, a membrane associated scaffold protein that regulates expansion of the aortic lumen. Stress related activation of AmotL2 disrupts apical/basal polarity by preventing PAR and Crumb complexes from reaching the apical membrane, leading to tumour formation and invasion .